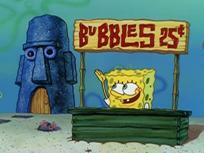 Bubblestand (Episode) – From SpongePedia, the biggest SpongeBob-wiki in the world! "Hey Squidward! Wanna blow some bubbles?" 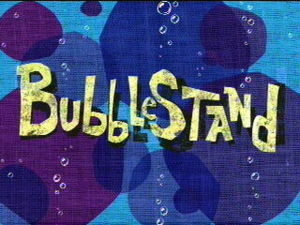 Bubblestand is an episode from Season 1. SpongeBob walks outside and admires the peacefulness of the neighborhood. Suddenly, he loudly sets up a bubblestand outside of his pineapple in order to teach others how to blow bubbles like he does. This annoys Squidward, who requests SpongeBob to be quiet. SpongeBob slows down and eventually finishes his stand. For 25 cents per lesson, he attempts to teach Patrick some of his tricks, showing him the technique that allows him to blow bubbles in various shapes and sizes. One elephant-shaped bubble (Which Patrick calls a giraffe) floats into Squidward's window, thus attracting his foul temper. An angry Squidward marches out and attempts to blow a bubble that will upstage SpongeBob without using the technique, but he fails. He tries this over and over again, while SpongeBob and Patrick try to remind him of the technique. Finalley he gives in and sarcastically imitates the technique. He succeeds and creates a bubble so large it floats away as SpongeBob and Patrick cheer. Filled with pride, Squidward goes back into his house and plays the clarinet. However, the large bubble returns and engulfs his house completely. It floats toward the surface as he plays his clarinet. Suddenly, the bubble bursts, sending his house crashing to the sea-bottom. Squidward struggles to play his clarinet afterward. Prince Paul wrote a song about this episode. It can be heard on The SpongeBob SquarePants Movie soundtrack. The bubble-blowing technique includes references to "The Time Warp" from The Rocky Horror Picture Show. Clips from this episode appeared in the 2005 film Zathura, while the main characters were fighting over what to watch (the choices were SpongeBob SquarePants or SportsCenter). The ending of Squidward's clarinet solo is similar to the end of the early How to Play Blue's Clues theme. The title card background was used again in the episode Earworm. This is the only episode with the most writers. This page was last modified on 19 April 2019, at 22:52. This page has been accessed 43,843 times.